The Vassalboro Public Library has an excellent selection of books for all ages and all interests, from board books to Large Print thrillers, international bestsellers to local favorites and little-known titles. We also offer a wide variety of audio and video titles, as well as internet access(including wireless) through three public desktop computers, all with word processing capability, printing, and access to online databases of thousands of journals, newspapers and reference materials. We encourage one and all to visit us and see for yourself what Vassalboro Public Library has to offer: print out your resume, learn something new, get help with homework, bring your kids or grandkids to Story Hour, volunteer, meet up with friends and neighbors, or just come in and say hello! 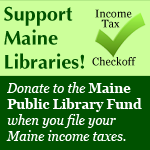 You’re always welcome at the Vassalboro Public Library.